What Are Five Foods That Fight Belly Fat? Getting rid of stubborn belly fat that bulges over your jeans can be done by eating power foods. Specific foods contain nutrients that can help you battle the bulge. Carrying weight in your midsection can increase your risk for health problems. The body contains two types of abdominal fat -- visceral fat that surrounds the organs and subcutaneous fat that is visible. Both of these fats can be reduced with a healthy diet. Almonds are filled with monounsaturated fats and protein that promote weight loss and can shrink the waistline. MayoClinic.com places almonds as the No. 1 weight loss food. Monounsaturated fats that are found in almonds promote weight loss, particularly in the midsection. However, be mindful of how many almonds you are snacking on because although almonds are healthy, they are also high in calories and should be eaten in moderation. Leafy greens promote weight loss in the midsection because they are filled with fiber, which helps keep you full longer, preventing overeating and allowing you to eat fewer calories. 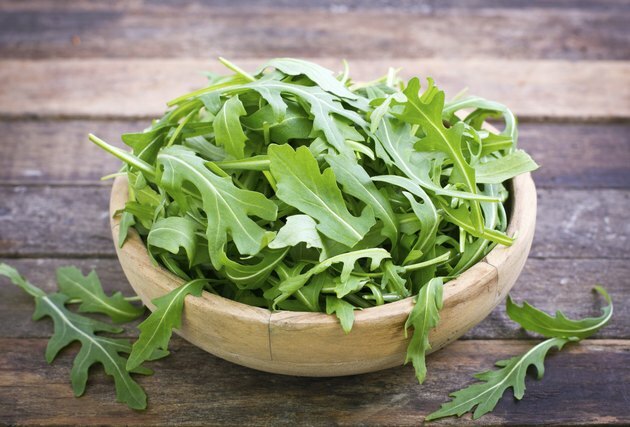 Leafy greens such as spinach, arugula and broccoli are all good choices that are low in calories and high in fiber. Oatmeal and other whole grains can help banish belly fat. A study completed at Pennsylvania State University followed participants for 12 weeks to investigate a connection between whole grain consumption and weight loss. The study was published in the "American Journal of Clinical Nutrition" in January 2008, indicating that people who consumed grains experienced greater fat loss from the abdominal area compared with those not eating whole grains. Berries can help tame your belly. Berries such as strawberries, blueberries, blackberries and raspberries are all fruits that are high in fiber. These fruits keep you full longer and will help you avoid overeating unhealthy foods throughout the day. Adding berries to your oatmeal or low-fat yogurt will boost your nutrients and your ability to reduce the waistline. Drinking green tea daily can also help shrink your waistline because of catechins in the tea leaves. The "Journal of Nutrition" reported a study in 2009 that found the effects of green tea catechins on fat loss in exercising subjects. The study revealed that participants consuming 625mg of catechins with 39mg of caffeine experienced a greater abdominal fat loss compared with participants consuming a control beverage with 39mg of caffeine and no catechins.